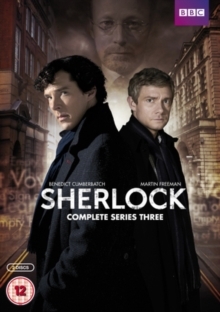 All three episodes from the third series of the BBC's fast-paced modernised crime drama based on the characters created by Arthur Conan Doyle. Laptops, mobile phones and the internet are the new tools for crime in a modern London under threat from serial killers, bombings and gang warfare. Sherlock Holmes (Benedict Cumberbatch), the most brilliant intellect of his generation, has a unique analytical brain unlike anyone else's, and staves off the ever-present threat of boredom by solving crimes, the more intricate and baffling the better. Meanwhile, his friend and flatmate, John Watson (Martin Freeman), is an army doctor invalided home from the battlefields of Afghanistan. The episodes are: 'The Empty Hearse', 'The Sign of Three' and 'His Last Vow'.